Samuel Robson “Rob” Walton is an heir to the fortune of Walmart, the world’s largest retailer. Walton is the eldest son of Helen and Sam Walton. He served as Chairman of Walmart from 1992 to 2015. 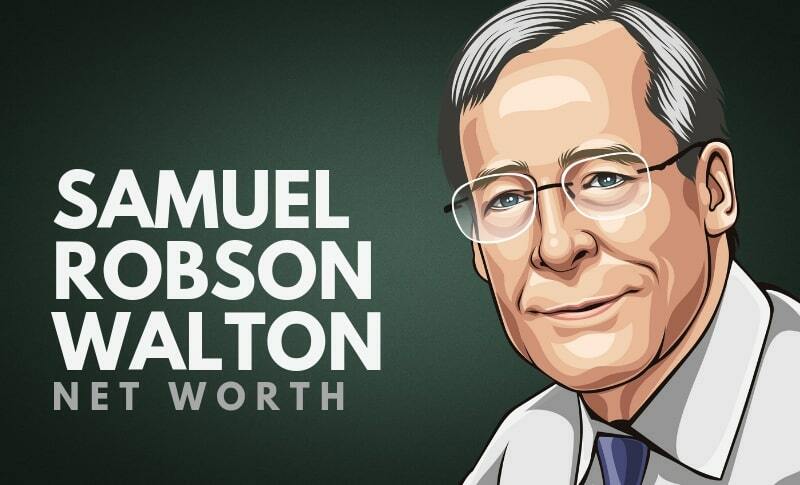 As of 2019, Samuel Robson Walton’s net worth is roughly $44.5 billion, which makes him one of the richest people in the world. Samuel Robson Walton was born on the 28th of October, 1944, in Tulsa, Oklahoma. Walton is the eldest of four children of Sam Walton and Helen Walton. He has a younger brother, Jim Walton, and a younger sister, Alice Walton. His other brother John Walton died in 2005. Walton attended The College of Wooster and graduated from the University of Arkansas in 1966. He received his Juris Doctor degree from Columbia Law School in 1969. After Walton graduated he became a member of the law firm that represented Wal-Mart. In 1978, Walton left Tulsa to join Wal-Mart as a senior vice president, and in 1982 he became vice chairman. He was named the chairman of the board of directors in 1992 two days after his father’s death. Alongside with his siblings, he has pledged about $2 billion to the Walton Family Foundation from 2008 to 2013. He joined a law firm and was a member of the law firm Conner and Winters in Tulsa Oklahoma. Walton later left the firm to join his father’s company. He occupied the posts of senior vice president, secretary, and general counsel and vice chairman at Walmart. By the time he left Tulsa in 1978, Walton had three children, was divorced from his first wife, and was remarried to Carolyn Funk. He and Carolyn filed for divorce in 2000. Walton married his third wife Melani Lowman-Walton in 2005. He was ranked at #17 on the 2013 Forbes list of world billionaires with a net worth of $26.1 billion. On the 2013 Forbes 400 list of the richest people in America, he was ranked at 9. Walton is a well-known collector of automobiles. As of 2019, Samuel Robson Walton’s net worth is $44.5 billion. Always take criticism in the right way, not personally, but try to change the problem in the criticism. Even if you lose or going through hell, keep fighting. Commit to your business. Believe in it more than anybody else. Never forget why you started in the first place, there was a reason why you started. Appreciate everything your associates do for the business. A pay-check and a stock option will buy one kind of loyalty. But all of us like to be told how much somebody appreciates what we do for them. We like to hear it often, and especially when we have done something we’re really proud of. Samuel Robson Walton is one of the richest people in the world. Alongside his siblings and family, he is an heir to the fortune of Walmart, the world’s largest retailer. As of 2019, Samuel Robson Walton’s net worth is estimated to be roughly $44.5 billion dollars. What do you think about Samuel Robson Walton’s net worth? Leave a comment below.